Rochester Post Bulletin reporter Heather Carlson filed the following story after U.S. Health and Human Services Secretary Sylvia Burwell toured the Mayo Clinic Biobank on Friday with U.S. Senator Amy Klobuchar (DFL-Minn.). Mayo Clinic President and CEO John Noseworthy, M.D.,and Keith Stewart, M.B., Ch.B., director, Center for Individualized Medicine, guided the walking tour of the Biobank and Biorepositories Program and explained to Sec. 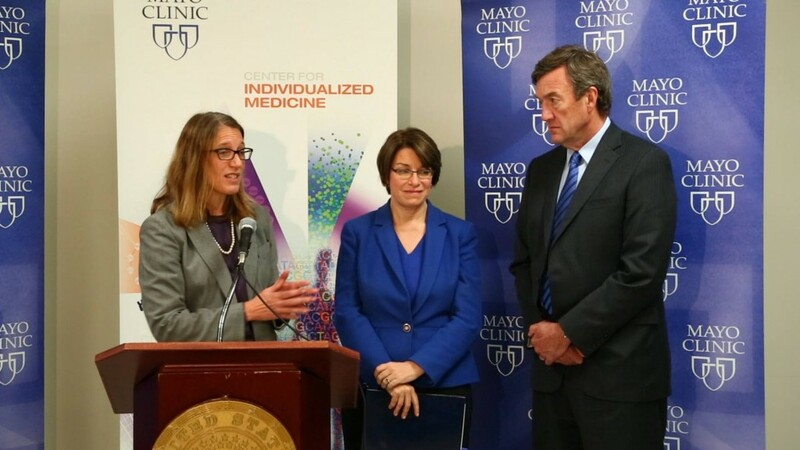 Burwell and Sen. Klobuchar how Mayo Clinic is using the Biobank to support its commitment to precision medicine. U.S. Health and Human Services Secretary Sylvia Burwell emphasized the importance of investing in precision medicine and health care research during a visit Friday to the Mayo Clinic Biobank. Burwell told reporters the work being done at Mayo Clinic to personalize medicine is critical for the future of health care. That type of medicine involves analyzing a patient's genes to help determine the best medical treatments for that individual. The Biobank has 50,000 samples from volunteers that researchers can tap into to help advance precision medicine.